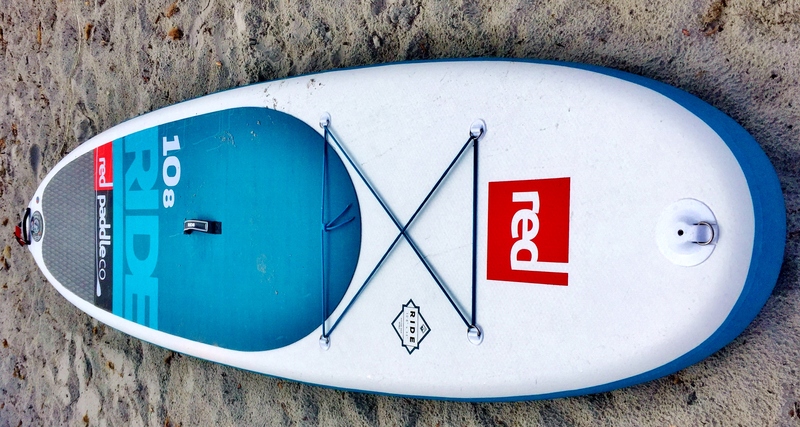 Red Paddle Co’s Ride range is probably the most popular inflatable SUP on the market. With premium build quality – utilising the brand’s now synonymous and patented MSL Fusion manufacturing technique – and incorporating a polished aesthetic, but with plenty of performance embedded for every day paddlers, it’s no wonder. At 34” width Red’s 10.8ft Ride is a stable platform – especially when you push in some extra PSI (don’t worry, this iSUP can sure take it). There’s plenty of room for more than one paddler so a spot of tandem riding is doable and it’s also great if you’ve got young kids and want to introduce them to the sport too! Even though the Ride is a rounded nose affair there’s good glide and efficient tracking to be had. We took the 10.8ft off on a four mile jaunt, out and back, with some chop and wind in the mix and found it held its own against more touring inspired shapes. OK, it’s not quite as fast but it’s no slouch either. The colour coded red moulded fins protruding from the Ride’s hull are surprisingly efficient. Personal preferences do lean towards hard types but you can’t deny Red’s style do work for the type of SUPing most people enjoy and will be practising with this inflatable. Manoeuvres are fun and it’s a good board to practice and get to grips with pivot turns and moving feet about the deck – these skills knocking on to your onwards progression. And when introduced to a few small wavelets the Ride delivered some giggle inducing experiences which only elevated its likeability. There’s no denying Red Paddle Co. are right on their game when it comes to inflatable stand up paddle boards – we’ve mentioned this before. We’d go so far as to say the brand have it nailed in terms of SUP across the board (pun intended!). Red’s Ride 10.8ft fits what most people want (and need) within stand up. A non-specialist tool, manufactured to high spec, that gives access to all areas of the sport it’ll find favour with all kinds of different riders – young to old, newbie to experienced and so on. Use as a family fun toy for days at the beach or take ‘off piste’ for slightly more serious paddling exploits. Red’s bag and Titan pump only add to the appeal. Also available in 10.6ft, 9.8ft and WindSUP versions (which we reviewed the March issue of SUPM).